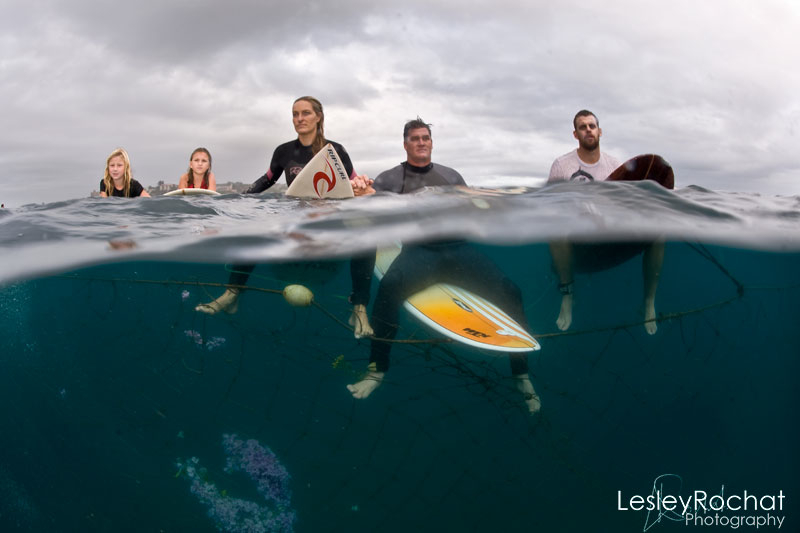 Soon after the loss of five tiger sharks and one white shark in the shark nets in the marine protected area (MPA) of the Aliwal Shoal, Cormac McCreesh told me he was organizing a ‘paddle out’ in honor of all the sharks and other marine life killed in the nets, similar to the paddle out surfers do when a surfer has died. 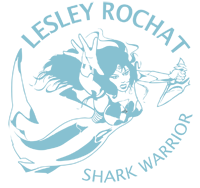 In support of this, we decided to launch our poster campaign, CATCHES ANYTHING, KILLS EVERYTHING, which has been incredibly well received worldwide. It created more impetuous around the current shark net issues, and helped to direct traffic to details about the upcoming event. By the time I arrived in Durban, Trevor Hutton and Terry Corr, our head of education at AfriOceans, were totally exhausted but on an extreme high having just completed a hugely successful road show – to them I extend a BIG well done and thanks, you guys are AWEsome! They had traveled up to Durban, visiting numerous schools along the way, presenting our DEEP FREEDIVE FOR SHARKS campaign, our AWEsome AfriOceans Warriors environmental education programme, and collecting hundreds of handprints for our HANDS UP FOR SHARKS scroll from enthralled young learners. See photos here. My exhaustion matched theirs: it had been none stop shark issues over 12 days, ranging from sharks dying in the nets, a shark ‘attack’, a questionable research vessel tagging our sharks, to the launch of our campaign. At 6.30am, very puffy eyed from accumulated lack of sleep, I was taken through an easy launch from Umkomaas by Walter Bernardis, Terry and Trevor with us. Considering all the politics amongst dive operators, I felt strongly that an outsider i.e. someone not directly linked to shark conservation or shark diving, would have the best success in gathering together the dive operators to support it. I was right with a fantastic turnout of a couple of jet skis and 14 dive boats from African Watersports, Agulhas House and Diving, Aliwal Shoal Adventures, Aqua Rush, Blue Vision, Blue Wilderness, Diving in Africa, Oceanworx, The Shoal, and the Umkomaas Lodge Dive Charter. A grey sky set a sombre tone to what followed, a low-key ceremony with participants floating close to the Scottburgh nets. Terry tried to liven up the event with his “SAVE OUR SHARKS, REMOVE THE NETS!” chants, which I joined. As activists we are well rehearsed in participating in public demonstrations, but the crowd preferred the lower key and our voices faded back into their silence. A great banner which read “Stop the murder! 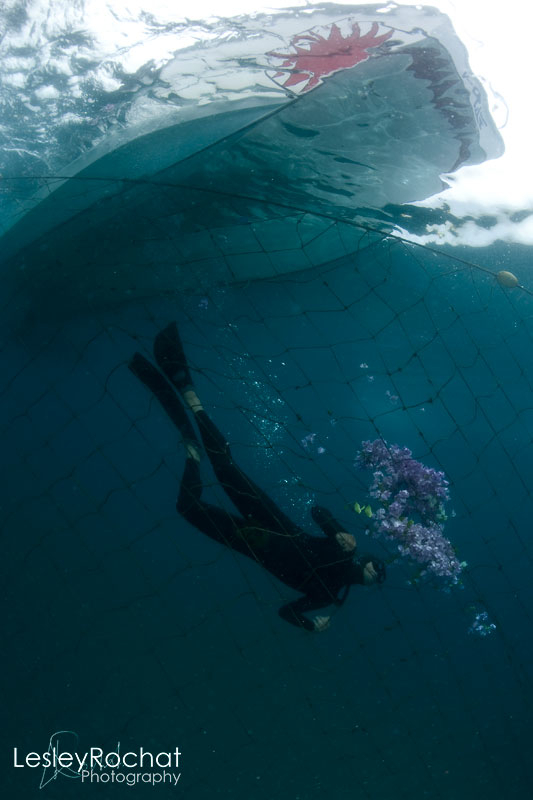 Remove the nets!” stood out, a couple of surfers floated above the nets, and flowers, leaves and a bougainvillea garland were strewn into the ocean, the garland later placed in the shark nets. Alen Walker and Ivan van Heerden, amongst other photographers, captured splendid images while a beautiful poem was read out by Natascha Weber, and Amanda Barratt representing SharkLife, delivered a powerful speech. The few words I shared began with thanking Cormac and to all those that attended, and how great it was to see so many people gathered (up to 100), even those against each other, putting aside differences and supporting the cause as a unit, the way it should be. Echoing what others felt, I stressed that it was important that the nets be removed from the MPA, and that we engage with the Sharks Board and municipality to find solutions for beaches frequented by bathers within the MPA. Then it was time to jump in the water with Trevor and take a couple of photos myself. Heading back a dead ray was found in the nets, the marks on its body revealed its desperate struggle to free itself. But from these walls of death there is no escape and the poor animal became just another statistic of the thousands killed. It was a truly special event, filled with hope, the dead ray reinforcing our motivation to come together. It was therefore disappointing to later hear that it was dampened by someone slinging a snide remark at me while out of earshot, which was cheered on by his supporters. Clearly I had spoken too soon – slaves to their own issues, they were unable to be gracious and put down their weapons of difference at such a significant event. I’m an activist so it doesn’t bother me what people say about me, and I actually thought the remark was very funny: “Is that Lesley? Didn’t recognize her with her clothes on!” LOL! It’s no surprise, however, that the hundreds of ‘like’s’ and ‘shares’ on the Facebook post of our CATCHES ANYTHING, KILLS EVERYTHING poster with me naked in the nets does not include a single one of these individuals, despite it being a powerful campaign against the nets. But what does worry me is how we will ever win this battle while another battle against each other, the ones who care about the animals, exists. As much as I dislike the Sharks Board I am willing to sit with my enemy, engage with him, and find a way to save our animals. By the same token I extend a challenge to recognize that while we might not all like each other, we need each other to win this mammoth battle. The longer I am a conservationist the more I become aware that the environmental battles we fight are nothing compared to the battles against human frailty we are up against. They are very often what prevent us from achieving our conservation goals. 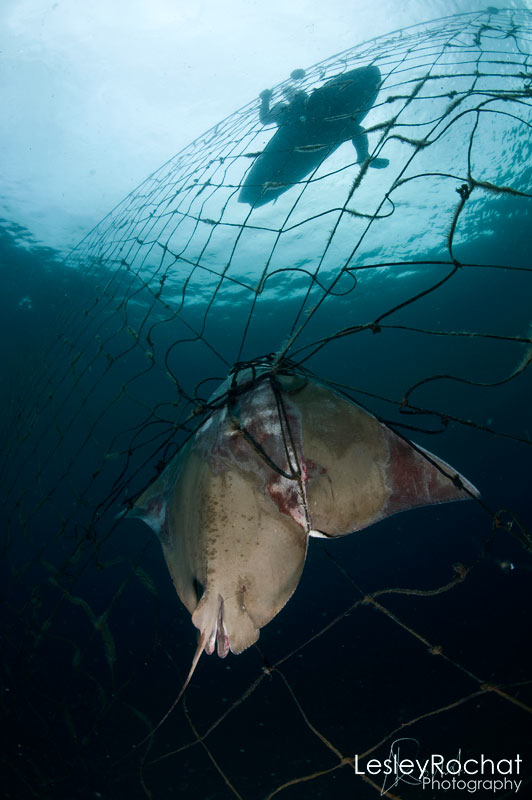 It is sad, but I believe that this is one of the obstacles standing in our way from making progress to save our sharks and other marine life from dying in the shark nets. I do, however, believe that Sunday’s event was blessed by Hope’s presence, and was a positive move in the right direction toward a long road that still lies ahead. 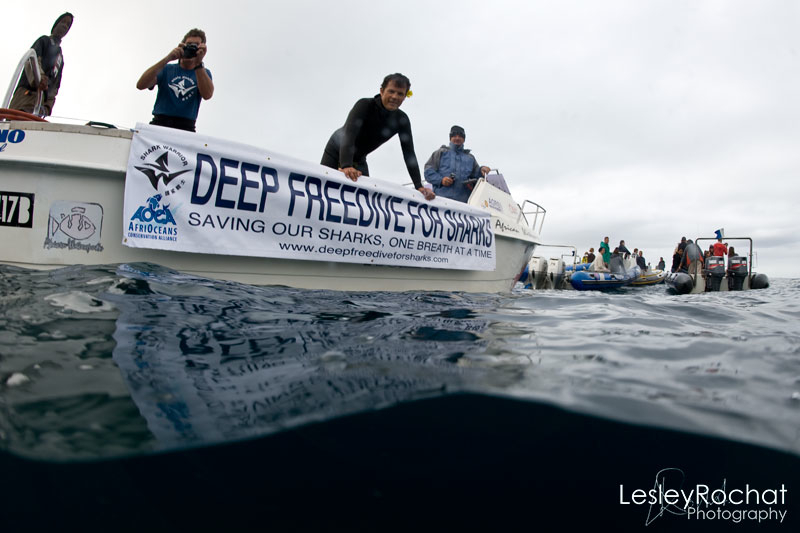 PS: follow DEEP FREEDIVE FOR SHARKS and Trevor’s training for the record attempts from 31st May.